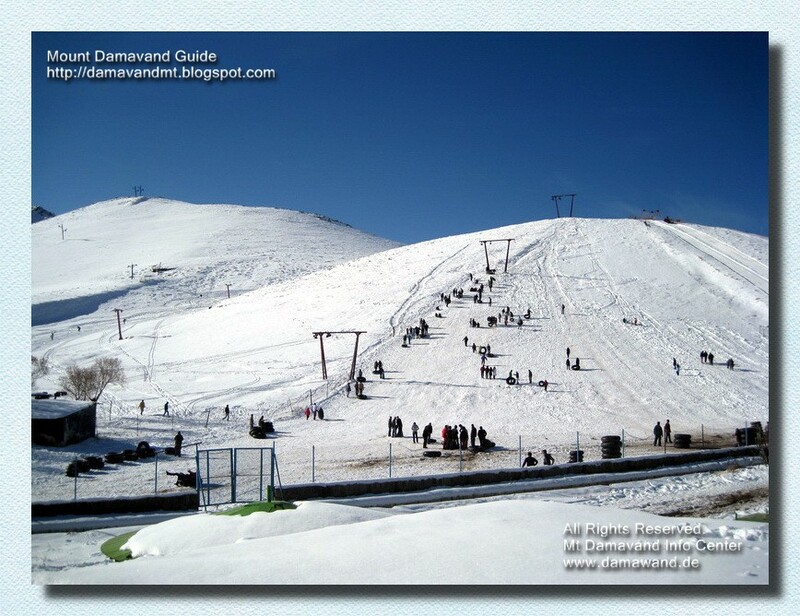 Damavand Ski Mountaineering and Snowboard Tour . Ski expedition tours Alborz and Zagros Mountains. Hiking & trekking and climbing tour Iran. Winter guided ski touring Damawand Iran. Iran winter sport, ski, snowboard, monoboard tour. Abali ski resort was built in 1953, it is the first ski slope in Iran to install mechanical ski lifts. This small resort is the birthplace of modern skiing and winter sport in the country, its ideal for beginner skiers. It has a training classes with coaches to give opportunity for students and newcomers to learn ski. Abali ski piste is located about 70 Km north east of Tehran on the Haraze Road and it is the closest ski reort to Mount Damavand Iran. Abali Ski Resort is in a touristic area with a cool temperature in summer which offers excellent non-skiing interests such as hiking & trekking, climbing and thermal spring waters, the good-looking Mosha Area with lots of villas, many traditional restaurants and recreational facilities, making this region much unique from other ski fields in Iran. Visit also Abali Weather Forecast. Open to Public: Tuesday, Wednesday, Thursday, Friday, Saturday, all year round. Located on Haraz Road 70km East of Tehran, Ab Ali Town, State Tehran, Country Iran. IKA International Airport or Mehrabad Airport Tehran, Iran. Fly to Tehran IKA International Airport and then travel by road to Haraz Road. Only accessible by road and can be reached by coach or car. The journey time is about 60 to 80 minutes drive from Tehran, about 70 Km. After a heavy snowfall, snow chains may be necessary for some part of the journey. There is no railway station in the area, the closest railway station is at Tehran. Note - Haraz Road is crowded with traffic jams in Iranian weekends. Abalı Skigebiet Teheran, Iran. Abali Skipiste Iran. Skifahren in Abalı Ski Resor in Alborz Mountains Iran. Wintersportreisen Iran. Ab-Ali Ski and Snowboard Tour. Winter-Outdoor-Aktivitäten Teheran. Sightseeing und Abenteuer-Tour Ab Ali. Iranskitours zu Alborz Mountains. Abali Wettervorhersage. Ski Wetter und Schneevorhersage für Abalı Skigebiet. Skiwetter Informationen Teheran. Ski- und Snowboard-Touren Expedition Iran, Skitouren und Skitouren zu Alborz & Zagrosgebirge Iran. Wintersport Touren Persien. Iran Skiurlaub. Iranische Skitouren Reise. Iranische Skiführer. Iran Off-Piste Ski-Touren. Ski- und Snowboardtouren. AbAli Ski Resort Tehran, Iran. Abali ski piste Iran. Skiing in AbAli Ski Resor in Alborz Mountains Iran. Winter sport tours Iran. Ab-Ali Ski and Snowboard tour. Winter outdoor activity Tehran. Sightseeing and adventure tour Ab Ali. Iranskitours to Alborz Mountains. Abali Weather Forecast. Ski weather and snow forecast for AbAli ski resort. Ski weather information Tehran. Ski and snowboard expedition tours Iran, Ski touring and ski mountaineering to Alborz & Zagros Mountains Iran. Winter sport tours Persia. Iran ski vacation. Iranian ski mountaineering travel. Iranian ski guide. Iran off-piste ski activities tours. Iran ski and snowboard tours. ABALI esquí de Teherán, Irán. Abali Pista de esquí Irán. Esquiar en ABALI Ski Resor en Alborz montañas de Irán. Deporte de invierno recorre Irán. Ab-Ali Ski y Snowboard Tour. Invierno actividad al aire libre Teherán. Turismo y turismo de aventura Ab Ali. Iranskitours a montañas de Alborz. Abali Previsión meteorológica. Tiempo de esquí y pronóstico de la nieve de la estación de esquí ABALI. La información del tiempo de esquí de Teherán. Esquí y excursiones expedición de snowboard Irán, esquí de fondo y esquí de montaña a Alborz y Zagros Montañas Irán. Deporte de invierno recorre Persia. Vacaciones de esquí Irán. Irán viajes de esquí de montaña. Guía de esquí iraní. Irán fuera de pista de esquí Actividades excursiones. Irán esquí y snowboard excursiones. Useful links Damavand Iran, Damavand Trek, Damavand Hike. ABALI Ski Resort Téhéran, Iran. Abali piste de ski de l'Iran. Skier dans ABALI Ski Resor dans Alborz Mountains Iran. Sports d'hiver tours Iran. Ab-Ali Ski et Snowboard Tour. Hiver activité de plein air Téhéran. Curiosités et d'aventure tournée Ab Ali. Iranskitours à Alborz Mountains. Abali Prévisions Météo. Météo Ski et prévisions de neige pour ABALI station de ski. Informations météo ski Téhéran. Ski et snowboard visites expédition Iran, ski de randonnée et de ski alpinisme à Alborz & Monts Zagros en Iran. Sports d'hiver tours Perse. Iran vacances de ski. Voyage iranienne de ski alpinisme. Guide de ski iranien. Iran activités hors-piste de ski visites. Iran ski et de snowboard visites. Abali Ski Resort Teheran, Iran. Abali pista da sci Iran. Sciare in Abali Ski Resor in Alborz Mountains Iran. Sport invernali tour Iran. Ab-Ali Sci e Snowboard tour. Inverno attività outdoor Teheran. Visita e tour di avventura Ab Ali. Iranskitours di Alborz Mountains. Abali Previsioni Meteo. Meteo Sci e previsioni nevicate delle stazioni sciistiche Abalì. Informazioni meteo Ski Tehran. Sci e snowboard tour spedizione Iran, sci alpinismo e sci alpinismo a Alborz e Zagros Mountains Iran. Sport invernali tour Persia. Vacanza sulla neve Iran. Iraniano viaggio sci alpinismo. Guida di sci iraniano. Iran fuori pista attività skitour. Sci alpinismo e snowboard Iran. Abali Ski Resort Teheran, Iran. Abali skiløypa Iran. Ski i Abali Ski Resor i Alborz-fjellene Iran. Vintersport turer Iran. Ab-Ali Ski og Snowboard Tour. Vinter utendørs aktivitet Teheran. Sightseeing og opplevelsestur Ab Ali. Iranskitours til Alborz-fjellene. Abali Værmelding. Ski vær og snø prognose for Abali skianlegg. Ski værinformasjon Teheran. Ski og snowboard ekspedisjonsturer Iran, Ski touring og ski fjellklatring til Alborz & Zagros-fjellene Iran. Vintersport turer Persia. Iran skiferie. Iransk ski fjellklatring reise. Iransk skiguide. Iran off-piste ski aktiviteter turer. Iran ski og snowboard turer. AbAli Горнолыжный курорт Тегеран, Иран. Abali Лыжная трасса Иран. Горные лыжи в AbAli горнолыжного RESOR в Алборз горы Ирана. Зимние виды спорта туры в Иран. Ab Али Лыжный и сноуборд тур. Зимний активный отдых Тегеран. Достопримечательности и приключенческий тур Ab Али. Iranskitours к Эльбрус гор. Abali Прогноз погоды. Лыжная погода и снег прогноз на горнолыжном курорте AbAli. Информация о лыжном погода Тегеран. Горные лыжи и сноуборд экспедиции туры Иран, Лыжные прогулки и лыжный альпинизм Алборз и Загрос Иран. Зимние виды спорта туры в Персию. Иран горнолыжный отдых. Иранский горнолыжный путешествия. Иранский горнолыжный руководство. Иран внетрассового катания Катание на лыжах туры. Иран лыж и сноубордов туры. AbAli Gornolyzhnyy kurort Tegeran, Iran . Abali Lyzhnaya trassa Iran. Gornyye lyzhi v AbAli gornolyzhnogo RESOR v Alborz gory Irana. Zimniye vidy sporta tury v Iran . Ab Ali Lyzhnyy i snoubord tur . Zimniy aktivnyy otdykh Tegeran . Dostoprimechatel'nosti i priklyuchencheskiy tur Ab Ali . Iranskitours k El'brus gor. Abali Prognoz pogody . Lyzhnaya pogoda i sneg prognoz na gornolyzhnom kurorte AbAli . Informatsiya o lyzhnom pogoda Tegeran . Gornyye lyzhi i snoubord ekspeditsii tury Iran, Lyzhnyye progulki i lyzhnyy al'pinizm Alborz i Zagros Iran. Zimniye vidy sporta tury v Persiyu . Iran gornolyzhnyy otdykh . Iranskiy gornolyzhnyy puteshestviya . Iranskiy gornolyzhnyy rukovodstvo . Iran vnetrassovogo kataniya Kataniye na lyzhakh tury. Iran lyzh i snoubordov tury.